FBI arrests group seeking arms for "the Resistance"
This week the FBI arrested five men of Lebanese origin who are accused of trying to buy 100 Stinger shoulder-fired antiaircraft missiles, as well as 250 assault rifles. The men stated that the missiles would be used against helicopters and aircraft - specifically F-16 fighter jets. According to the FBI report, the men wanted the weapons shipped to Syria or Iran for use by "the Resistance." It goes on to say, "the 'Resistance' group was not further identified." The Resistance group was unidentified? Okay, let's try Middle East Terrorism 101. The men accused of trying to acquire the weapons are of Lebanese origin. They were attempting to acquire weapons capable of downing an F-16. Let's see - Lebanon and the F-16. Who flies F-16 aircraft over Lebanon on an almost daily basis? The Israeli air force. Who fires at the Israeli aircraft, with little effect? Hizballah. They would like to acquire a better capability. The weapons were to be shipped to either Syria or Iran. Who are the primary weapons suppliers of Hizballah? Syria and Iran, mostly via Damascus airport and the highway into the Biqa' Valley. What is the Arabic name for the militia associated with Hizballah? Al-muqawamah al-islamiyah. It translates to "the Islamic resistance." A simple Google search will tell you this. 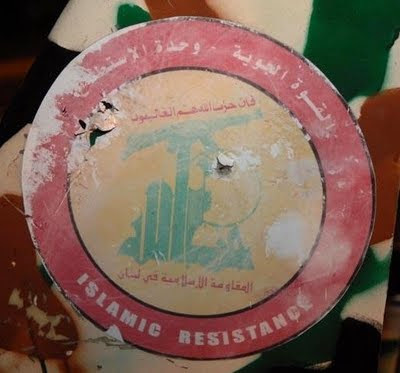 Hizballah is not shy about it - they paint it on their equipment. This is a section of a UAV shot down over northern Israel during the war between Hizballah and Israel in 2006. The logo is that of Hizballah - the Arabic words at the top read - "Air Force - Reconnaissance Unit." Above the English "Islamic Resistance" are the Arabic words al-muqawamah al-islamiyah fi lubnan - the Islamic Resistance in Lebanon. Seems pretty clear to me. These guys were trying to buy antiaircraft weapons for Hizballah to shoot down Israeli aircraft. The weapons were to be delivered via Syria or Iran. Why don't they just say that? The recent violence in Yemen, which has included a fairly substantial Saudi military cross-border operation, should not be confused with al-Qa'idah operations on the Arabian Peninsula. It is true that there are many al-Qa'idah operatives in Yemen - they have relocated to the weakly-governed country from Saudi Arabia, Iraq, Pakistan and Afghanistan. However, the group operating on the Saudi border are not al-Qa'idah - in fact, they are radically different. Bad guys, to be sure, just not of the al-Qa'idah ilk. These are the Huthis, named for the now-dead leader of the group, Husayn Badr al-Din al-Huthi. This group first appeared in 2004 when they began a series of protests against the government in Sana' for its cooperation (little as its has been) with the United States in the war on terror. Al-Huthi was killed in the initial uprising. What is unique about the Huthis is that they are Shi'a Muslims. Most of the population of Yemen are Sunnis, as are virtually all members of al-Qa'idah. There is no apparent cooperation between the Huthis and al-Qa'idah. However, there are indications that the Huthis are being supported by another terrorist organization - the Iranian Islamic Revolutionary Guard Corps. In late October, Yemen claims to have intercepted a ship carrying Iranian weapons to the Huthis. This makes sense - the Iranians are noted for supporting Shi'a groups - Hizballah is the prime example. It should be noted that the Huthis follow a different Shi'a tradition than the Iranians. Iranians are overwhelmingly "Twelver" Shi'a, in other words, they believe in the succession of Muhammad through 12 imams. The Huthis are Zaydis, sometimes referred to "Fiver" Shi'a since they believe in the succession of Muhammad through the first five imams. The fifth imam was Zayd ibn 'Ali (hence the descriptor "Zaydi"), the great great grandson of the prophet Muhammad - most Zaydis live in Yemen. That said, it is plausible for the Iranians to be assisting the Huthis. Wherever there are Shi'a militants, there seems to be Iranian support. 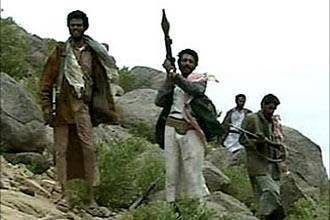 The Yemeni government has accused the Iranians of providing weapons to the group via Eritrea, as well as moving Hizballah militants from Lebanon. Last week, Iran announced that it was deploying warships to the Gulf of Aden supposedly to join in the fight against Somali pirates operating in the region. One could make the case that they are actually there to support the Huthis. Realistically, what do the mullahs in Tehran hope to gain by supporting the Huthis in Yemen? Are they hoping to create a Shi'a state on the Arabian Peninsula? Are they hoping to overthrow the government of 'Ali 'Abdullah Salih? Perhaps they want to lessen Salih's alleged (I use that word for a reason) cooperation with the United States in the war on terror? None of those are the primary reason for Iranian interference in Yemeni affairs. It has to do with Yemen's neighbor to the north, the Kingdom of Saudi Arabia. Iran and Saudi Arabia have longstanding animosity on several levels. Both nations sit astride the Persian Gulf - Saudi Arabia to the west, Iran to the east. The Iranians, who are mostly ethnic Persians, believe it is called the "Persian" Gulf for a reason. In contrast, the Arabs refer to it as the Arab Gulf, and it is written that way on maps printed in the Arab world. Most of us who have to deal with the Arabs simply refer to it as al-khalij - "The Gulf." The Huthis have been active along the Saudi border, at times crossing into Saudi Arabia. The Saudis have reacted militarily, moving warships into the Red Sea to interdict the arms route from Eritrea. They have also conducted air strikes into northern Yemen and moved ground forces into the area. They have pledged to continue their military operations against the Huthis until the Huthis withdraw from a 10-kilometer security strip inside Yemen. At least six Saudi soldiers have been killed in the fighting. If Iran is in fact supporting the Huthis as the Yemeni government claims, it may be trying to cause problems for Saudi Arabia. 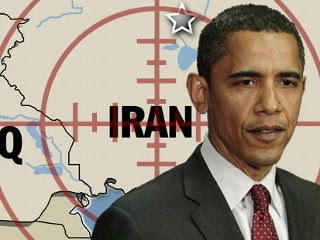 This comes at a time when the world is beginning to seriously focus on Iran's nuclear program. It may be an attempt to divert some attention from that issue, or it may be an attempt to convince Saudi Arabia not to support the American position on that issue. Bottom line: It won't work. Many people care about the Iranian nuclear issue. Few people care about a group of Shi'a rebels in the mountains of Yemen. According to news reporting from President Obama's Asia tour, the United States and its allies are "discussing possible new penalties to bring fresh pressure on Iran" for its intransigence over its nuclear research and development program. Iranian leaders announced Wednesday that the country would not agree to export its low-enriched uranium, as it had agreed to earlier, but did stress its willingness to continue to talk about the nuclear issue. Is anyone deducing a pattern here? The Iranians make an agreement, then renege on the agreement, then agree to more talks about an agreement. All they have really committed to do is talk. When those talks fail, they agree to talk about more talks. All the while, thousands of centrifuges continue to enrich uranium. At some point, the Iranians will have enough uranium that can be further processed into weapons grade fissile material to manufacture a nuclear weapon. Of course, they will still be willing to talk about it. The American and West's reaction? We're going to consider and "discuss possible new penalties." They are enriching uranium in defiance of virtually the entire world, and we are talking about doing something - we don't know what exactly, but according to the President, our patience is wearing thin. The meaning of "wearing thin" is open to interpretation. Iran has been playing this delaying game for years, successfully. President Obama is now "preparing for the next phase" if Iran does not meet Obama's year-end deadline - that must be the definition of wearing thin. Of course, the President has a problem with deadlines, so why should the Iranians take his deadline seriously? A series health care reform deadlines have been missed, and it is a foregone conclusion that the one-year deadline to close Guantanamo will be missed. So, why should the Iranians be worried? In the President's own words, "They have been unable to get to 'yes', and so as a consequence, we have begun discussions with our international partners about the importance of having consequences. Our expectation is, is that over the next several weeks we will be developing a package of potential steps that we could take that will indicate our seriousness to Iran." Surprisingly, this was described in the media as "tough talk." Well, they got the second words correct - talk. Obama talks - I am sorry, I mean "begun discussions" - the Iranians talk, everybody talks. Ah, but the Iranians are also continuing their nuclear program unabated. This is exactly the Iranian plan - talk, delay, talk, delay, knowing full well that there is little chance of effective sanctions. The Iranian intelligence services have probably prepared their version of a National Intelligence Estimate assessing that an American military strike on their facilities is highly unlikely. If by some chance President Obama was to consider it, the decision would take so long that the Iranians may have a nuclear weapon by then. If the President cannot make a decision on troop levels for the ongoing military operation in Afghanistan, the Iranian intelligence services likely doubt he will be able to make one quickly on this issue. The Iranians also have correctly assessed that their two friends on the United Nations Security Council - Russia and China - each with veto power, are not likely to agree to effective sanctions. Iran's energy sector, the primary weakness that could be exploited, is off the table. So much for the "crippling sanctions" promised by Secretary of State Hillary Clinton. The Iranians have outplayed the Obama Administration - and by that I mean the President and his Secretary of State - at every turn. Is it any wonder that the Iranians do not take their threats seriously? I have been extremely critical of President Obama's policy toward Iran. I even called his policy feckless - and I still believe I am correct. At some point, the President is going to realize that Iran has no intention of abandoning its quest for a nuclear weapons capability, regardless of his attempts to "engage" or negotiate. It only makes him, and by extension the United States, look weak. Each time Obama or his Secretary of State makes another overture to Iran and it is soundly rejected, he looks like a beggar seeking any island of success in what has been a sea of policy failures in the region. Okay, let's assume the President calls me on it. What are our options in dealing with Iran? They are few. Allow Iran to have a nuclear weapon, or do something about it - now. First - we need to stop appearing to be weak. We are by all measure still the pre-eminent military and economic power on the planet. (I will forgo comment on the President's economic policies.) When I recall my dealings with the Iranians over the years, I am reminded of their reaction to the Iran Airbus incident of 1988. On July 3, 1988, the USS Vincennes accidentally shot down Iran Air flight 655 over the Persian Gulf, killing all 290 people on board. For years after that incident, Iranian officers I encountered abroad insisted to me that they believed the attack was deliberate and meant to send a message to the Iranians that the United States would not allow Iran to prevail in the Iran-Iraq War. By the time of the incident, the war had been raging for almost eight years. The United States in 1988 began "clandestinely" supporting Iraq - it was not a well-kept secret. Several of the officers confided that they were afraid of the United States. That's a good thing, and something that can be exploited. Second, tell the Iranians clearly where we stand. State unequivocally that the United States will not allow Iran to possess a nuclear weapon. It's that simple - they need to know we are serious. Explain that if they continue on their current path, if they continue to enrich uranium and develop technologies that have only nuclear weapons applications, the United States will act. We have already shown extraordinary patience, but that patience has run out. It is time for the Iranians to realize they are dealing with a superpower. Say it and mean it. Third, back up your words. Direct the Joint Chiefs of Staff to prepare contingency plans for possible operations against Iran. Do this with the same publicity that you are usuing in deliberating and determining a course of action - which is long overdue - in Afghanistan. You maintain that the "all options" are still on the table - that includes the military option. Make sure the Iranians understand that you know you are the commander in chief of capable extremely military forces. 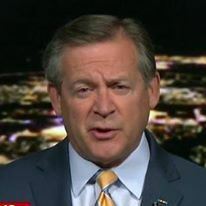 Hint, no, don't hint, be very clear - while there may be a perception that American is busy with two wars, those wars primarily involve ground troops. A military blow to Iran will come from the air and sea. That doesn't give away any secrets, it simply reflects common sense. It would not hurt to start a modest buildup of military assets in the area - that means U.S. Navy carrier groups and combatants, and U.S. Air Force land-based aviation assets. Move enough missile-carriers and bomb-droppers to create a credible threat to the Iranian nuclear program. There may be some doubt that the Israeli air force can mount enough of an attack at the extreme combat radius of their aircraft in mostly hostile airspace. There should be no doubt that American air power does not suffer from the same limitations - that air power also includes a host of very accurate standoff weapons. The window of opportunity for Iran to modify its behavior should be closing. The United States, in conjunction with allies if possible, or alone if necessary, should be prepared to do what has to be done. Make a nice speech - you're really good at that - but make sure you get the message across. After diplomacy is exhausted - it appears to me that it is going nowhere - and the military option be the last resort, we should be prepared for the inevitable Iranian response. The Iranians will no doubt mobilize their terrorist proxies, most notably Hizballah in Lebanon and both Hamas and Islamic Jihad in the Gaza Strip. They may attempt to attack American military ships and bases in the Middle East. In the extreme, they may even launch some sort of missile strike against Israel. We must be very reticent about this - if we start it, we should be prepared to finish it. Many Iranians and possibly many Israelis will die. The bottom line: if we are serious about denying the Iranians a nuclear weapons capability, we need to be committed to that position. Otherwise, stop posturing, admit another policy failure and start planning for dealing with a nuclear-armed Iran. 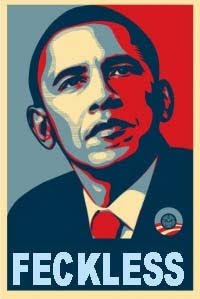 Mr. Obama, about your Iran policy - can you spell f-e-c-k-l-e-s-s? That pretty sums up the present Iran policy of the Obama Administration. I hate to keep harping on this - it seems that most of my writings and comments of late deal with this subject. Either the President is persistent or he just doesn't get it, but his policy of "engaging" Iran has proven to be ineffective, incompetent and futile, yes, feckless. The latest indication that they - by "they" I mean the President and equally inept Secretary of State Hillary Clinton - don't get it came today. Faced with an outright Iranian rejection of an American-supported plan by which Iran would export most of its enriched uranium for processing into proliferation-safe fuel rods, the Administration announced that it wanted to "give some space to Iran to work through this. It's a tough issue for them, quite obviously, and we're hoping for an early positive answer from the Iranians." An early positive answer from the Iranians? Mr. Obama, how many times do you have to be told no before you understand that you are being manipualted by the Iranians? They agree, then backpedal, then agree to talk about more talks, then send signals that they hope they can still reach a deal, and offer to talk about more talks. All you have gotten out of the Iranians is an offer to talk about talks. You have gotten not one concrete concession from Tehran. On the other hand, the Iranians have played you like a cheap 'ud (lute). They have been able to lure you into one-on-one talks in Iraq that went nowhere - Iran still provides money, weapons and training to Shi'a militias that have American blood on their hands. Not only are they supporting the Iraqi militias, they are now funneling improvised explosive device components to the Taliban in Afghanistan - more American blood on their hands. Now the Iranians threaten to try three young American hikers on espionage charges. I guess "engaging" hasn't really helped that aspect of our relationship, has it? What else have they gained from your naivete? By sponsoring the enriched uranium export agreement, you have legitimized their nuclear research program. You even agreed to more one-on-one talks, further legitimizing the regime. When demands that Iran stop enriching uranium were ignored, rather than successfully orchestrating the imposition of economic sanctions, you have given them more time, over and over. Of course, they have offered to talk. I guess to you, that is the same as "engaging." Now you are willing to give the Iranians until the end of the year to agree to the export arrangement. Why? They have had months, even years to accommodate the demands of the West about their nuclear ambition - they have chosen not to. They repeatedly ignore the United Nations and various coalitions of nations, each time agreeing to more talks. While they are playing you and delaying any resolution of the nuclear issue, they continue to enrich uranium and conduct research into weapons design and development. Mr. President, it's time to do something other than let the Iranians agree to talk. That is not progress, nor is it success, well not for you - it is a huge success for Iranian foreign policy. "Engaging" is not working. Continuing it in the face of repeated failures makes you look weak, yes, even feckless. Any remaining doubts about Iran's nuclear intentions? Events of the past few weeks should quiet any remaining skeptics about Iran's true ambitions for its nuclear research and development program. While many of these events taken individually may not be the "smoking gun" that Iran's apologists (IAEA chief Mohamed ElBaradei/Muhammad al-Barada'i comes to mind) demand, when taken in the aggregate leave little doubt as to what they are attempting to accomplish. 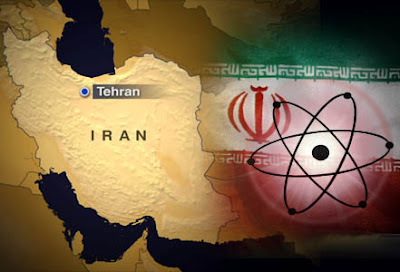 Although Iran insists that its uranium enrichment efforts are to provide fuel for the Tehran research reactor and eventually for an electric power generation capability, the program is much too large, dispersed and protected in hardened facilities for a "peaceful" program. The electric power generation argument fails in light of the simple fact that Iran wastes more energy from the gas flares on its oil wells than all the electricty its combined nuclear facilities could ever produce. The latest, and probably most damning information to Iran's pretense of a peaceful nuclear program came this last week. Surprisingly, it came from the International Atomic Energy Agency (IAEA), an agency notoriously ineffective on the Iranian nuclear issue and usually reluctant to find anyone in violation of international nuclear agreements. The IAEA announced that it had acquired information that Iranian scientists may have tested an advanced (even by Western standards) nuclear warhead design based on what is called "two-point implosion." This technology, closely guarded by the United States and the United Kingdom, is cutting-edge and allows the production of warheads small enough to fit on existing Iranian missiles. The Iranians admit researching this technology. There is no peaceful use for this technology - it is only used to produce thermonuclear weapons. I suspect that the Iranians have made this rather substantial leap forward by buying the technology, most likely from Pakistani nuclear engineer 'Abd al-Qadir Khan. Khan confessed in 2004 to selling nuclear weapons technology secrets from Pakistan's successful program to Libya, North Korea and Iran. There are also reports of Russian weapons experts involved in Iran as well. Given the status of Russia's economy, this is not out of the question. On November 7, Iranian senior lawmakers rejected the "deal to disarm Iran" supposedly agreed to on October 1, touted by the American Administration as the breakthrough and vindication that its engagement policy towards Iran has been successful. Under the "deal," Iran was to export its low-enriched uranium to Russia and France, where it would be made into fuel rods for the Tehran reactor. Iran initially agreed, then pressed for a modification whereby it could just buy fuel rods and keep its low-enriched uranium, or slow down the export of the material. Now it has rejected exporting any of its enriched uranium. Delay, delay, delay - all the while continuing to enrich uranium. Call me skeptical, but could "the deal" possibly be in jeopardy? It's not going to happen. Since the deal was announced on October 1, Iran has continued to enrich uranium at at least one facility, producing as much as 10 pounds of low-enriched uranium every day. Every day that the Iranians are successful in delaying effective sanctions, they are that much closer to producing the amount of material required to develop a weapon. Wake up! They're building the bomb! 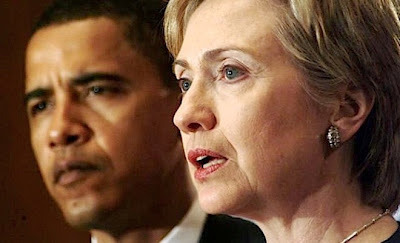 President Barack Obama and his Secretary of State Hillary Clinton (above), not to mention a host of special envoys, have yet to show any progress on any issue in the Middle East. Remember the campaign rhetoric - "Who do you want to answer the phone at 3:00am when there is a crisis in the Middle East?" Thankfully, there has not been such a call - yet. Neither the President nor his Secretary of State seems up to the task, regardless of the spin coming out of the White House and Foggy Bottom. The most serious and urgent issue is the situation with Iran. President Obama, true to his campaign pledges, has made numerous appeals to the Islamic Republic, including allowing a few one-on-one meetings between Iranian and American officials. In every instance, the Iranians have successfully outmaneuvered the Obama administration. Iran continues its nuclear program (no one really believes it is for electric power), continues to support numerous terrorist groups and continues to oppress its own citizenry who dare speak out against the regime. Despite being rebuffed at every attempt, the President still hopes to "engage" Iran. When is he going to get the message that they do not want to talk seriously to the United States? 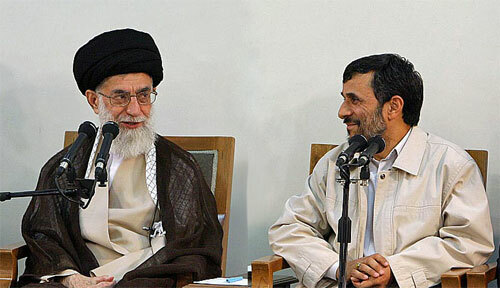 In the words of Iran's Supreme Leader just a few days ago, "We do not want any negotiation, the result of which is predetermined by the United States. Every time they have a smile on their face, they are hiding a dagger behind their back. They are telling us to negotiate, but alongside the negotiation there is a threat...."
At some point, hopefully in the not too distant future, Mr. Obama and Mrs. Clinton are going to come to the realization that talking to the current regime in Tehran is useless. The Iranian leadership is not going to fore-go its quest to acquire a nuclear weapons capability, nor is it likely to cease its support for terrorist groups, most notably Hizballah and Hamas. Despite United Nations resolutions, Iran has completely rearmed Hizballah after the group's 2006 war with Israel. It continues to ship weapons to the group - a vessel from Iran loaded with 320 tons of munitions was seized off the coast of Israel this week. The weapons are said to have been destined for a Syrian port for final shipment to Hizballah. In Gaza, Iran has supplied rockets to Hamas that can reach all the way to Tel Aviv. Likewise, Iran's Islamic Revolutionary Guard Corps' Qods Force continues to provide money, weapons and training not only to Shi'a militias in Iraq, but now also to the Taliban in Afghanistan. While the President seeks to "engage" Iran, the Iranians are killing our troops by proxy. Thus far, all of the Administration's efforts toward Iran have failed. The Iranians see his repeated attempts to engage them as a sign of weakness and capitulation to their demands. Not only American attempts not worked, the President and Secretary have failed to gain international support for effective sanctions. Mr. President, your policy toward Iran is not working. If you insist on talking to them, then change the rhetoric. Stop the diplo-speak and be clear. Start with, "We will not allow you to develop a nuclear weapon." Small words, easy to understand. If they still want to talk after that, continue with, "Stop supporting groups that are killing American troops, or we'll start killing yours. We're actually quite good at that." It can't be any less effective than what you're doing now.